An obvious concern with this graph is what to make of the data for the single data point of 1940, based on Census data. Is there a reason why marriage homogamy might have dropped so much from 1940 to 1960? Or is there just something in the way that 1940 data was collected or tabulated that makes it not directly comparable to the later data? 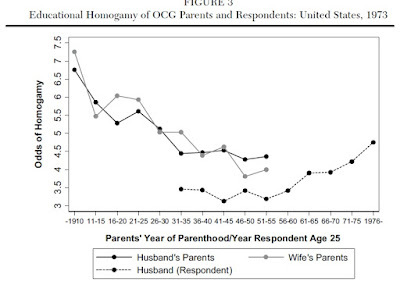 In this paper, Mare makes use of previously unutilized data data on what adults report about the marriages of their parents to extend this data back in time. 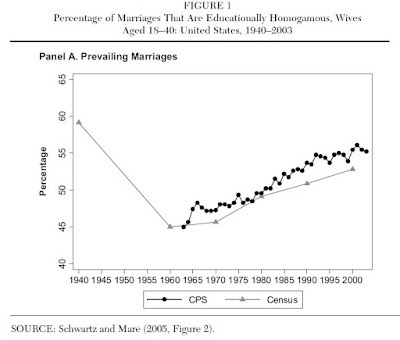 He finds that there is indeed a downward pattern of marriage homogamy in the first half of the 20th century. educational choice. 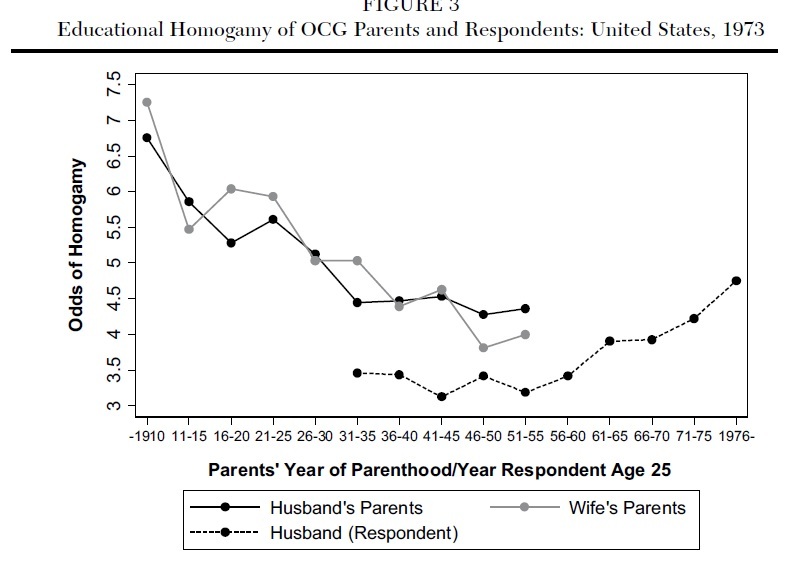 During the latter half of the twentieth century and especially since the 1960s, the differences in earnings across individuals with varying amounts of education grew markedly, a trend that has a strong positive association with various indicators of educational assortative mating for couples who married during this era." In short, social and economic inequality clearly interact with marriage homogamy. On one side, in a society with higher levels of inequality, people are less likely to interact with others from different socioeconomic groups in a way that would lead to heterogamy. On the other side, a society with more marriage homogamy will will be one in which those with higher wage and employment prospects are marrying each other. As a result, differences in household income will be larger. In addition, those households will have greater resources to invest in their children, which could lead to a greater persistence of inequality across generations. Many different factors affect marriage and economic inequality, but still, it seems unlikely to be a coincidence that homogamy was associated with greater inequality of the wage distribution and higher returns to schooling both early and late in the 20th century, while heterogamy was associated with a more equal distribution of income and lower returns to schooling in the middle of the 20th century.